There’s very few things that feel as bad as calling in a professional having them flip and switch and charge you. You’re both out money and can feel embarrassed, or in a professional situation and have a difficult time justifying this cost to whomever you report to. Usually this can be prevented in a few easy steps. #1 Check Your Breakers: Breakers can trip for a variety of reason some of which may be a one time instance and not a point of concern. Before calling a professional I would recommend locating and resetting any tripped breakers, bearing in mind that there will typically be an inside panel as well as one outside by the meter. If the breaker immediately or consistently trips you still may want to take one more step before contacting a professional. In the effected area unplug everything and turn all switches off then reset breaker. If they hold, try plugging in items one at a time, then flip switches back on one at a time. 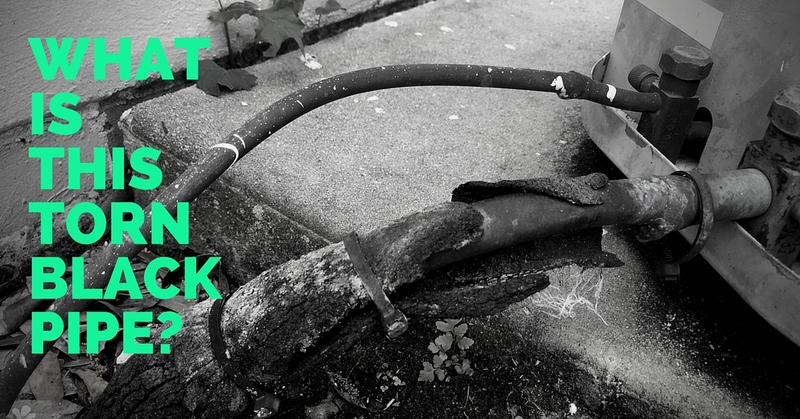 If the problem persists or the breaker trips with something you cannot just unplug, it’s time to call a pro. #2 GFCI’s: A GFI’s primary function is to simply check for any voltage imbalance so it is pretty normal for these to trip intermittently. Unless they are tripping more frequently than once a week it is usually not a necessity to repair. GFCI’s will be installed for all bathroom, kitchen, garage, and outdoor outlets will be on a GFI. Keep in mind that one outlet can run up to 10 protected outlets. so if you have an outlet not working in one of these locations, check and reset all GFI’s in the house before calling an electrician. 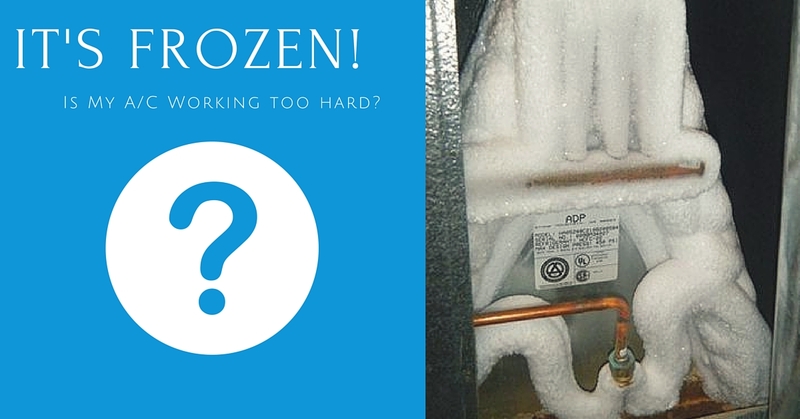 #1 Frozen AC system: An AC will freeze for three reasons: low temperature, low indoor air flow, or low refrigerant. If you have a frozen AC make sure of two things before calling someone; Make sure there the filter in the unit isn’t dirty, and make sure the thermostat is not set below 72°F. If you suspect either a dirty filter or low set-point were the cause set the system to off and fan to on for 3 hours then restart the system and it may resume normal operation. #2 Backed up drain. Your AC will condensate up to 2 gallons of water an hour. This will run from the indoor unit and drain outside usually via a 3/4″ PVC pipe. If sediment plugs up this pipe it will either back up into the house causing a mess or newer AC units will have an overflow shut off or “float” switch. If you have a blank thermostat or a system doing nothing you should first check this “float” switch for water. If this is full, empty it. Hook a shop vac to the outlet outside, pull the sediment out, refill the drain trap and reinstall the float switch and test the system. #3 Tripped breaker, See above for testing a tripped breaker. #4 Thermostat batteries, if the thermostat is blank make sure the batteries are not dead. #1: Pilot light is out: On gas water heaters if there has ever been a interruption in gas service to the property, (even briefly) the pilot will need to be relit. Follow the instructions on the heater to do this. #2: Tripped breaker: While typically a tripped breaker is a sign that one of the electric elements is shorted, it is not a bad idea to try resetting it and see if the problem still occurs. 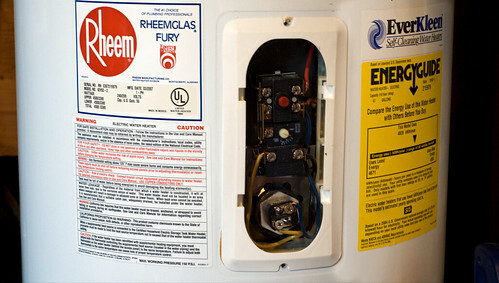 #3: Tripped high limit: All electric water heaters will have a high temperature cutout safety on the upper thermostat. Should this trip repeatedly than there is a problem (if however you only have to occasionally reset it, it may not be worth repairing). This safety reset is a red circular button behind the upper access panel on the side of the heater. #1: Make sure the pool pump is running and that it does not have a very dirty filter. #2: Make sure all water is flowing through the heater and that there aren’t any valves diverting water away from the heater. #3: Check to make sure all breakers are on. #4: If there is cold air blowing out of the top of a heat-pump heater, it is operating correctly and may just not be at optimal temperature yet. This doesn’t necessarily mean its running at full capacity but would mean it is at least somewhat heating. #5: Make sure the gas valve is on. My A/C Froze Up! Is it Running Too Hard? Your air conditioner is similar to you and I. It doesn’t like getting started, but once it gets going it feels a lot better. Starting and stopping more often is not good for your air conditioning system, he is perfectly happy running all the time, he just doesn’t like having his motives questioned. Your A/C doesn’t especially like really hot days, not because of how much he has to run, it just causes his blood pressure to rise and when you are a demanding boss and set the thermostat down REALLY low (Below 75) it does irritate him even more. He doesn’t mind working hard, he is PROUD of his work ethic! Rather, he get’s annoyed when your expectations of him exceed what he can deliver. He can see your disapproving brow looking at his thermostat face. First, he gets discouraged, but if you keep pushing him he gets angry! Let’s say you got irritated and dropped that thermostat down to 68 degrees during the heat of the day when the house was 77 inside. Your A/C units begin hatching a plot against you that can have nasty consequences. During the day when the home is still warm inside everything is fine with the air conditioning, other than the fact that you feel warm. As evening approaches and the temperatures outside dip your air conditioner will begin actually getting you down… down… down towards that ridiculously low temperature you chose in your rage. Now your bitter A/C snaps the trap and begins to FREEZE! Here’s the kicker, once he begins to freeze, the longer he runs the even more frozen he will become. You will then needs to shut him off long enough for him to become completely defrosted and WATCH OUT for the dripping tears of regretful water as he thaws. Your carpet, hardwood floors, and that mahogany chest your Uncle Theo got you are all potential victims. Of course, there are MANY other things that can cause an A/C to freeze, dirty air filters, refrigerant leaks and blower issues and anytime your A/C freezes you will want to have a professional give him a checkup. Just be a good boss and don’t provoke him. He likes to work hard, all he wants to do is please you, but everyone has their limit when you push their buttons too often. If you suspect your unit is sick or tired, and not just sick and tired of you setting the thermostat; give us a call at 352-243-7088. What is This Torn / Damaged Black Pipe on My A/C? What is A/C tubing insulation and what happens when it gets damaged? What is this torn black pipe? That torn black thing is actually tubing insulation often called by the brand name “Armaflex” in the trade. Usually you will find it torn or damaged near the outside portion of an air conditioning unit. This is often do to a combination of sun damage and / or damage from lawn implements such as weed eaters and edgers. The insulation on most system types covers the large refrigerant line that is traveling back to the compressor called the “Suction line”. This refrigerant line carries cool, vaporized refrigerant back from the indoor unit and this low temperature vapor helps to keep the compressor cool and running properly. On a “heat pump” system this line can also turn into into a hot gas line during the heating season. This means that the what was previously a cool line carrying refrigerant from inside out it is now a VERY HOT line carrying high pressure vapor from out to in. The good news is that the small section of tubing insulation that is exposed outside actually has very little effect on the operation of your system overall, however there is a small operational toll that can affect the compressor over time in an air conditioner. On a heat pump the insulation also serves to prevent an unwitting victim from receiving a burn as well as protects and wires that happen to be touching the line from melting. At Kalos when we install a new system we coat the lines with a manufacturer recommended UV coating. this white coating not makes the lines outside look a little nicer, it also protects the lines from damaging sunlight. If your line insulation is torn or damaged it is certainly no emergency, you may want to ask your service provider about replacing it on their next scheduled A/C maintenance visit. If you are interested in an A/C upgrade you can fill our the form below or call us at 352-243-7088 for any of your repair, maintenance or replacement needs. 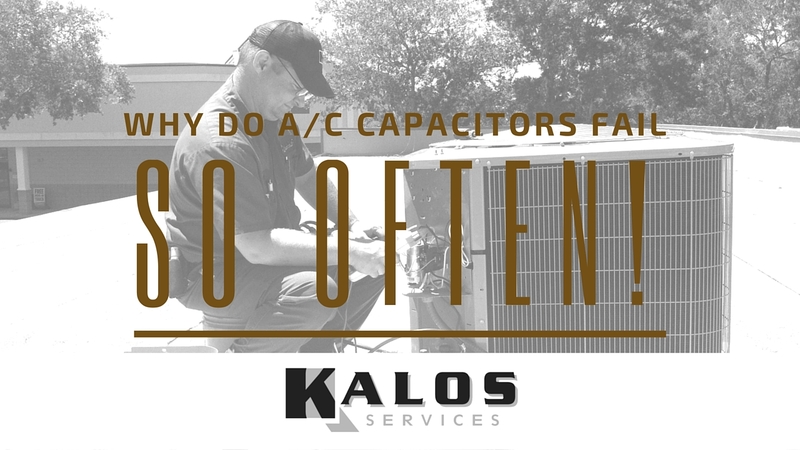 What is an A/C Capacitor and Why Do They Fail So Often? Hi I’m Bryan Orr. I’m one of the co-founders and co-owners of Kalos Services. We’re an HVAC electrical and construction company in central Florida. Actually out of Clermont which is in west side of town. We’re not that far from Disney World. One of the most common questions that I get … In fact, one of the most common questions that I find myself asking is why do capacitors on air conditioners fail so often? That’s the question. Why do they fail so often? First off, this is a capacitor. This is the top, you got three terminals. This is what’s known as a dual run capacitor. Not to be confused with smaller capacitors that are on electronics boards and then also even in an air conditioner you’ll have what’s called a start capacitor which is generally black and it’s a plastic coded capacitor of a much higher rating. The difference between a run and a start capacitor is a run capacitor is actually in the circuit at all times. Every time the motor is running. A motor that requires a run capacitor in an AC. Those motors are known as permanent split capacitor motors. Tech talk, all that really means is this is always in the circuit. If this capacitor fails, what will often happen is the motor either won’t start, it will run backwards, it will run hot, it will run inefficient. It just depends on the type of motor and how much load it’s under. A dual capacitor, what’s up with a dual capacitor. It has 2 features. That’s why it’s a dual capacitor. It has your common terminal here, which is the common point between the 2 halves of the capacitor. You have the fan terminal here which is where the outdoor fan connects. Then you have the HERM which is kind of a funny name, it’s kind of an old school name. It means herm for hermetic compressor. That just means a sealed compressor. That’s the big pump in your air conditioner on the outside. When these fail, basically the system stops working. Not only that, it can cause damage to the motors that it’s connected to when it fails because those motors run very hot and keep going out on thermal overload every time it fails. Again, this is a dual run capacitor. This type of capacitor is in your air conditioner on the outside. These are the kind that most often fail. They’re 2 in 1, two capacitors in one. You also will have capacitors often on your inside unit on your blower motor as well. Those fail less often but they do sometimes fail and they’re a little bit smaller. Let’s talk about how these are rated. I know this is a little technical but it you’re looking for a capacitor, you’re wondering what’s up with your capacitor. I want to teach you how to read the nomenclature on this. If you look here, you’ll see it says 40×7.5 MFD. This is something that will vary from manufacturer to manufacturer. Some of them will say MFD some will say MF and some will just have a omega symbol. Which is a Greek symbol that looks like an upside down U. What this means is 40 MifroFarad and 7.5 MicroFarad. The smaller of the 2 numbers is the MicroFarad rating of the fan capacitor and the larger of the 2 numbers is the MicroFarad rating of the big capacitor for the compressor. This means that your motor on the outside is running on a 7.5 MicroFarad capacitor and the compressor is running on a 40 MicroFarad capacitor. MicroFarads, that is how you rate a capacitor. There’s no other way to rate the actual capacity of a capacitor other than MicroFarads. This next part is where a lot of people will get confused because it lists a voltage rating here. 370 or 440 VAC or volts AC. A lot of people will say but my air conditioner’s only 240 volts or 120 volts or some people call it 110 or whatever. That’s not what this means. This doesn’t mean that this is the voltage that this runs on. This is the voltage at which the capacitor breaks down. Now funny things just started happening because for years manufacturers were installing 370 volt rated capacitors and the replacement market was using 440 volt capacitors. This means the maximum voltage that the dielectric fluid will actually be bridged. Or I should say the minimum voltage at which the dielectric fluid inside will be bridged. Here’s the point. That number means the maximum voltage that it can handle. A 440 VAC capacitor or a 440 V capacitor is better than a 370. The problem is people kept getting confused because if they had a 370 they would want to replace it with a 370. This manufacturer says 370 or 440 and they do that just to eliminate confusion from consumers primarily who think, oh my gosh my service company put in the wrong capacitor because the voltage says something different. They started putting both on their just to ease people’s minds. Truthfully, if it’s a 370 or 440 it’s actually a 440 and that’s good. Over here it says hertz. That’s the cycle rate. That means it says 50 or 60 and that means that it can work in US or Europe. What you really need to know, what it comes down to is … What you really need to know is the MicroFarads on your capacitor. Given this is a dual, that means that the MicroFarad rating between C and herm is 40 and the MicroFarad rating between C and fan is 7.5 because again this is 2 capacitors in one. Now to get to the real question that you’re asking. Why do they fail? I don’t have an answer to that question. When I first started in the trade 16 years ago as a technician. It was very rare that you would see capacitors fail. When I say very rare it was as common as a contactor failing or a relay or any other of the devices in an air conditioner. Now a days, capacitors fail at an extremely high rate compared to other components. The only thing I can say is that they must be being manufactured differently. The manufacturers who make these capacitors. I’m not talking about the equipment manufacturers because the equipment manufacturers, they don’t make their own capacitors. They’re buying them from other people. The manufacturers of the capacitors themselves, they’re just not making them like they used to. I know that sounds really weird. In fact I usually criticize people for that. This is based on real fact that I’ve seen. Is that these are just failing more than they used to. Now, here’s the good news. We use largely this brand which is an American manufacture brand. We use a couple brands but this is the most common that we use. We’re always looking at replacing the 440 volt capacitors which hold out better. We’re usually whenever possible, using this American made brand here. We’re seeing much lower fail rates on these capacitors than we’re seeing on other brands. Still not perfect but much better than what we see otherwise. Even a few manufacturers are starting to go to using this brand in their systems. When they do we see them drop. By in large, most manufactures are still using capacitors that have high fail rates. This isn’t one brand over another. It’s not like Trane is better than Carrier or Lennox is better than Trane. They’re all using capacitors that seem to have fairly high fail rates. One thing that an old timer used to tell me. I don’t know if this is … I can’t prove whether or not this is true. He told me that these are designed to be installed upright and so that when people install them on their side or upside down that that increases the fail rate. I have no way of knowing whether or not that’s true. I’ve never scientifically tested that. Ever since he told me that I always try to make sure that these are mounted upright whenever possible. Another thing that will come up is people will look at different ones, different capacitors and they’ll be different physical sizes. That doesn’t mean anything as far as I can tell. It’s just the physical size of the casing that they put the plates in. What’s going on inside here. There’s actually oil that’s … I think it used to be castor oil, I’m not sure if it still is, I think it might be. Let’s see here if it says. It doesn’t say on this one. There’s oil inside here and there’s some plates that basically wrap around in here and what happens is this just stores a charge. That’s what it’s designed to do. It helps get a motor started and running and efficiently and in the right direction. Not to get to hyper technical on how it works. What happens when they fail is that for some reason the charge bridges those plates or bridges the dielectric fluid and it causes it to fail. Generally speaking when these fail what you’ll find is the top here, instead of it being flat like it is here. It’ll actually bubble up and that’s by design. The top is actually the thinnest metal on the entire thing so the rest of this metal is very thick heavy gauge metal. On the top it’s a little bit thinner so if it over heats or if that dielectric fluid is bridged, this top gives and bubbles up. It’s basically so the thing doesn’t explode. It gives in one direction. If you ever see a capacitor like this where instead of the top being flat it’s bubbled. That’s an indication that it’s failed. That’s pretty much it. In order to test them either you can see that it’s bubbled or in the case that you suspect that it’s weak. You should really use a meter that has a MicroFarad gauge on it. There are ways to test them while the system is running. In most cases you’re testing them because the system is not running, the compressor or motor are not running so that’s why you would use a meter, a multi-meter that has a MicroFarad gauge on it. Ultimately, the question being asked is why do they fail? I don’t have an answer. We’re in Florida. That’s the market that I know. Florida hasn’t gotten any hotter than it used to be. A lot of people say it’s heat but that hasn’t really changed. Some people will attribute it to electrical power inconsistencies. I haven’t found that the electrical power is anymore inconsistent now than it was when I first started in the trade 16 years ago. But we certainly do see a lot more failures. Hopefully it’s something that the industry of capacitor manufacturers will get on top of. In the meantime this little component here can cause a little bit of trouble with your AC. We’re the guys you can call to help take care of it with the least hassle and making sure that the systems working good and everything else. When we do run into one of these we replace it but not only do we replace it we make sure to check all the connections that there’s nothing that could cause it to fail. Test the entire system, check [inaudible 00:09:57] charge, go through everything to make sure everything’s working properly so you don’t have any further issues, heaven forbid. Thank you for watching this again it’s Kalos Services. If you want to ever call us, you can call us at 352-243-7088 or visit us online at Kalos, K-A-L-O-S Florida.com, that’s kalosflorida.com. I’m Bryan Orr thanks for watching. Need Help With a Capacitor in Clermont, Orlando, Winter Garden, Kissimmee, Leesburg, The Villages or Windermere? Call us at 352-243-7088 or fill out this form.